I. 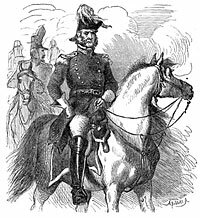 Throw off the old, & assume a new designation — the Union party; — adopt the conciliatory measures proposed by Mr. Crittenden, or the Peace convention, & my life upon it, we shall have no new case of secession, but, on the contrary, an early return of many, if not a;l the states which have already broken off from the Union, without some equally benign measure, the remaining slave holding states will, probably, join the Montgomery confederacy in less than sixty days, when this city — being included in a foreign country — would require permanent Garrison of at least 35,000 troops to protect the Government within it. III. Conquer the seceded States by invading Armies. 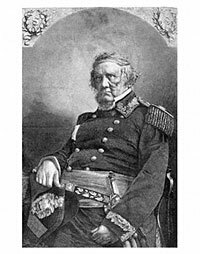 No doubt this might be done in two or three years by a young able General — a Wolfe, a Desaix or a Hoche, with 300,000 disciplined men — estimating a third for Garrisons, & the loss of a yet greater number by skirmishes, sieges, battles & southern fevers. The destruction of life and property, on the other side, would be frightful — however perfect the moral discipline of the invaders. The conquest completed at that enormous waste of human life, to the north and north west — with at least $250[,]000,000, added thereto, and cui bono? — Fifteen devastated provinces — not to be brought into harmony with their conquerors; but to be held, for generations, by heavy garrisons — at an expense quadruple the net duties or taxes which it would be possible to extract from them — followed by a Protector or an emperor. ….one bleak rain day they went over to his quarters. 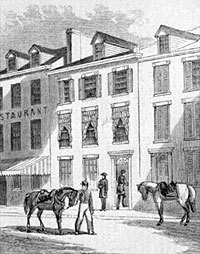 General Scott was so infirm that he could not come to the White House, or remain in the war department and he had taken a room for his quarters across the street, near the war department. When they went in he had a stick or two upon the first burning brightly, and they all took seats around the fire. 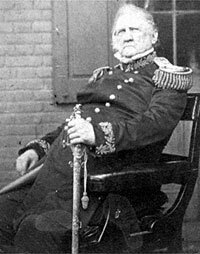 General Scott was lying on a low and broad lounge in one corner of the room. He had a strap attacked to a ring in the ceiling, and another ring at the end, reaching down over him a little below his breast, which he was accustomed to take hold of and pull himself up with, for he was very large and plethoric. After they sat down he got hold of that ring, with some trouble pulled himself to an upright position and swung his feet off the lounge upon the floor. Before they said anything they sat there looking at him, and he commenced his speech to the President. At the end of the war, Scott asked the President to pardon his grand nephew, a Confederate soldier, and Mr. Lincoln did so. 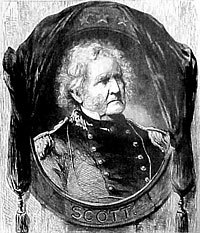 Scott was a hero both of the War of 1812 for actions on Canadian front and the Mexican-American War for leading an expedition to Mexico City. Well-traveled and well-connected, he knew everyone through his long career in the Army at stations in Washington and New York. 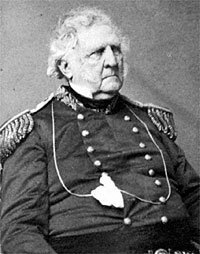 He was skillful at resolving political-military disputes and at embroiling himself in military personnel feuds. 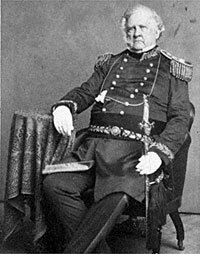 He had long had political ambitions and was the unsuccessful Whig candidate for President in 1852—the last serious presidential candidate of the Whig Party. Glyndon G. Van Deusen, Thurlow Weed: Wizard of the Lobby, p. 270. Walter A. McDougall, Throes of Democracy: The American Civil War Era, 1829-1877, p. 234. Russell McClintock, Lincoln and the Decision for War: The Northern Response to Secession, p. 64. McClintock, Lincoln and the Decision for War: The Northern Response to Secession, p. 87. Gideon Welles, Diary of Gideon Welles, Volume I, p. 241. Rufus Rockwell Wilson, editor, Intimate Memories of Lincoln, pp. 382-383. Roy P. Basler, editor, Collected Works of Abraham Lincoln, Volume V, p.50 (First Annual Message of President Lincoln , December 3, 1861). 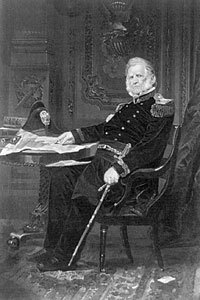 Michael Burlingame, editor, With Lincoln in the White House: Letters, Memoranda, and Other Writings of John G. Nicolay, 1860-1865, p. 82.